Recently the 2013 Gartner Magic Quadrant came out for Business Intelligence and Analytics. I'm not going to get into the subtle nuances of what makes a Gartner Magic Quadrant "magic", but if you've heard of a vendor, chances are they are on here. If that vendor is fortunate enough to be in the upper right, chances are they are a safe bet, and if they are in some other area you'd better be buying them for a very specific use case. 40+% of those rated are "leaders". One can only imagine how populous the "followers" box must be. 90+% of those rated are in half of the categories. Not exactly exploring the studio space on this graph, huh? There hasn't been a visionary in the business intelligence space since 2009 (there were 2 back then). Seems like a real growth opportunity. Thus far the only purpose this visualization serves is reminding me of the old adage that "half of all doctors are below average." The good news is that this heavy clustering in the upper right and lower left is nothing new. 2011 courtesy of The Dashboard Spy. This brings up the the more interesting point, which is the the addition of "Analytics" to this year's criteria. 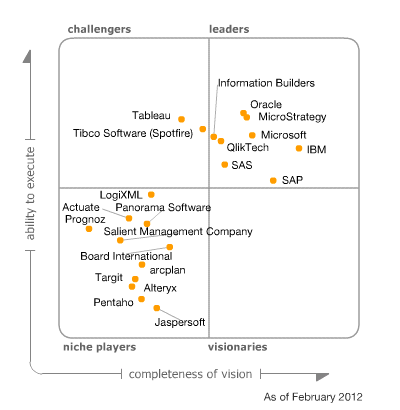 It seems fairly obvious from looking at the last few years' worth of quadrants that this was just a concession by Gartner that Tibco and Tableau could no longer be shut out of the leaders quadrant even though they don't fit the model of a traditional BI software provider. Theoretically this means that Gartner has finally given a nod to a meaningful change in the market. Pessimistically it sounds like they realized their model was broken and this was the easiest way to cover up that people were buying too much software that wasn't in the Magic Quadrant's most magic quadrant. This does leave us with a rather interesting situation where solutions that were formerly considered departmental (tools like Tableau, Qlikview, and Tibco) might now be tasked with meeting enterprise needs. Clearly the price tag is attractive, but I have a feeling that all of the same reasons keeping large enterprises from going to the cloud (maturity, FUD, and the difficulties in extending and customizing solutions) are going to keep these smaller vendors serving marketing or HR while Cognos and BusinessObjects present the majority of data within most organizations. In the end, I think Gartner's Magic Quadrant continues to serve the purpose it always has, which is a security blanket for those in procurement who won't buy any software that isn't at least mentioned. Only time will tell if that security blanket is getting a little thread-bare now that a vendors presence on here could mean they could be a safe bet for a large enterprise solution, a small or medium-sized enterprise solution, or even a departmental solution. For an SAP-specific slant, please check out Dallas Marks's thoughts. The last two years have seen a flurry of activity from the Analytics team at SAP. A lot of things that were promised were delivered. New tools like Visual Intelligence, Predictive Analysis? Check. Xcelsius roadmap (including the new Design Studio)? Check. BI4 stability? Getting checkier by the day. Are their some concerns still left with these items? Sure, but we are certainly better off on these fronts than we were a year ago. Certainly there are some advantages to allow these three semantic layers to continuing growing in their own directions. Innovation that applies to only one data source can be sped up because it doesn't have to worry about integrating with the others. Performance can be optimized because only one source system with its particular constraints must be considered. Unfortunately I don't think that begins to outweigh the disadvantages for both customers and SAP itself. The disadvantages for customers apply to both legacy SAP and classic BusinessObjects customers. The two key issues I see are the slowing of innovation across the portfolio and the extra work required to maintain multiple semantic layers. Even if SAP wanted to invest for all three data sources (HANA, BW, Universe) simultaneously, it just wouldn't make sense. Investing every minor semantic layer change in each system to work with all of the reporting tools in the portfolio would be absolute murder, not to mention that any change to a reporting tool would need to be run back through three different sets of semantic layer developers to ensure integration. This creates a lot of points of failure at a time when stability has been recognized as a serious source of concern for customers. If this three-headed monster continues, it also follows that the Total Cost of Ownership of any such system is going to balloon for customers. If the BusinessObjects platform has more things running under the covers that means more or at least bigger patches which means you'll need more administration time, more testing time, and more end user communication and training. 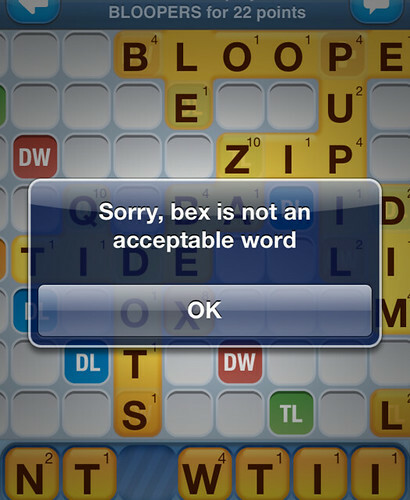 And that's just if you employ one of these tools. If you've got more than one semantic layer running you'll need to have experts in each, or one very thinly stretched expert (who will be constantly looking for another job). This also means more training for users, more confusion, and a real loss of goodwill from users who now have to understand connecting to multiple data sources in a reporting tool rather than just understanding how the Universe works and going from there. Multiple options exist. SAP could continue investing in all three, but that is problematic because of the reasons published above. Encouraging customers to run all of their HANA data through BW has some potential, but it seems that takes away a lot of the benefits of HANA without a lot of benefit from BW. They could invest heavily in HANA semantics and offer fantastic pricing, although that still won't solve the enormous amounts of data that are not and will never be stored in-memory that still need accessed (not to mention the loss of goodwill from legacy BusinessObjects customers whose only solution is buying new software). In the end the best solution is simple albeit not easy: make HANA and BW work properly through the Information Design Tool (IDT - the successor to the pre-BI4 Universe Designer). I know this wouldn't be easy, but I'm not sure why we have to actively encourage people to avoid the using the IDT when connecting to BW or HANA data sources. Perfect the "common" semantic layer for any data source, and every reporting tool downstream would be able to innovate on features and not just play catch up on connectivity. It would have been better to do this before the release of BI4, spending the million man hours on perfecting the semantic layer with slight tweaks to the reporting tools. I realize that exploding pie charts with sound sell software, but software that is easy to use and cheap to maintain sells itself. * It's worth noting that we also have legacy .UNV files (from the old Universe Designer and new Universe Design Tool), Analysis Views (for OLAP), Crystal Reports Business Views (which are deprecated but have no migration option). Inspired a little by Kurt Bilafer's mantra of "you don't need to get all of your ducks in a row, you just need to get some ducks on the water" I shared a post on the Decision Factor blog about which subject areas to start with in a new BI implementation. Please note, I'm not suggesting reporting off of these guys. If you were wondering why I hadn't posted my thoughts on last week's ASUG Annual Conference/SAPPHIRE Now, it's because I gave them over at ASUGNews.